This is one of the questions where most of the people giving tests have some misunderstanding. Answer is just under 200 years. Here is the history in more details. 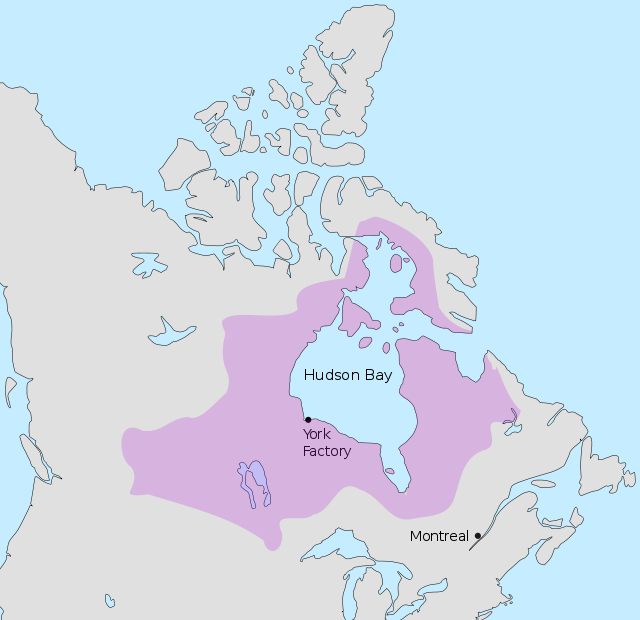 The Hudson’s Bay Company (which is currently known as “The Bay”) is one of the oldest corporation in Canada and Americas. In beginnings, its main business had been fur trade and the area of operation was Northern land that included Canada and USA (Today). It has been in business for 344 years BUT it doesn’t mean it controlled Northern Lands for 344 years. The fact that they are still in business have created this ambiguity. Here we are going to talk about it in detail in hopes that you can get a better picture. In Short, it controlled the northern lands for few years shy of 200 years. Here is a time line graph of the company. In 1670, King Charles II of England granted the Hudson’s Bay Company exclusive trading rights over the watershed draining into Hudson Bay. The land occupied by The Hudson’s Bay Company was called ‘Rupert Land’ (on name of first governor of HBC i.e., Prince Rupert who was the cousin of King Charles II). For next 100 years many French and British companies competed for fur trade. The Hudson’s Bay Company, with French, British and Aboriginal employees, came to dominate the trade in the northwest from Fort Garry (Winnipeg) and Fort Edmonton to Fort Langley (near Vancouver) and Fort Victoria—trading posts. Some of the competing companies were North West Company, East India Company, South sea Company, South Africa Company, Muscovy Company. All of these companies eventually failed and HBC remained and they became the largest landowners in north Americas. The land occupied by The Hudson’s Bay Company was called ‘Rupert Land’. Area it covered is shown in the picture above. In 1869 company approved the return of Rupert’s Land to Britain which in turn gave it to Canada on November 19, 1869. Canada gave £300,000 to compensate HBC for its losses. The deal, known as The Deed of Surrender, came into force the year after i.e., 1870. The resulting territory, now known as the Northwest Territories was included in Canada as a result. Province of Manitoba also came into existence at the same time. Actual sale/transaction happened on Nov 19th, 1869 but British government didn’t accept the transfer of the land until July 15th, 1970. Hence July 1st is celebrated as “Canada Day”. Thanks for such a detailed answer. There are many test site out there which said 300 years and it was getting confusing. All this summary has really helped me in clearing my mind about at least this question. That is what I like about this site. You guys are great! What an explanation! Thank you guys for clearing the doubts. The question is very tricky but the explanation says that just under 200 yrs.is the answer. Glad that it was helpful!